I added the milk to my blender first followed by the frozen strawberries, which I let soak for a couple of minutes to soften and prevent chunks. My Blendtec is powerful alright, but it doesn’t always pulverize larger fruit fresh right out of the freezer. 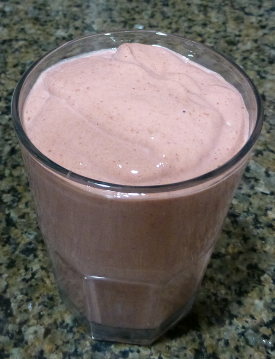 The strawberries and schizandra painted this smoothie a light red or almost pink color. Enjoy this medley of superfoods! I’d love to know if you try this schizandra berry superfood smoothie and how you liked it. Please leave a comment below. Happy Blending!